High-intensity focused ultrasound is the subject of investigation by physicians for use as a "bloodless scalpel" in a variety of different procedures. Rather than cutting into patients with primitive steel tools that haven't changed too much in the last several thousand years, doctors will focus high-intensity ultrasound beams at a particular spot in the body. This technique creates an extremely hot spot about the size of a rice grain; other tissues right next to the selected spot are not damaged. "You can penetrate deep into the body and deliver the energy to the bleeding very accurately," Vaezy said. Recent tests on pigs' lungs showed that high-intensity ultrasound sealed the leaks in one or two minutes. More than 95 percent of the 70 incisions were stable after two minutes of treatment, according to results published this summer in the Journal of Trauma. The findings suggest that ultrasound might replace what is now a painful, invasive procedure. Lung injuries are relatively common because the chest is a big surface that's often exposed to crushing or puncture wounds, said co-author Gregory Jurkovich, chief of trauma at Harborview Medical Center in Seattle and a UW professor of surgery. A busy trauma room like Harborview's, he said, admits about two patients with bleeding lungs per day. Often the bleeding can be stopped simply by packing the wound and applying pressure. In other cases, doctors insert a straw and drain the blood and air so the wound can heal. But in about one in 10 cases neither of these methods is successful, and doctors must operate to stop the bleeding. That means making a long incision and separating the ribs, and then either sewing up the organ or removing a section of the lung. 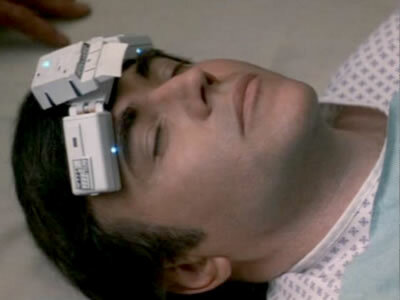 Star Trek fans may recall that Dr. McCoy has a nifty device that allows him to avoid cutting patients open; he angrily locks 20th century physicians in a closet rather than let them touch Chekov. "My god, man! Drilling holes in his head's not the answer! The artery must be repaired! Now put away your butcher knives and let me save this patient before it's too late!"